In the autumn 1892, the young couple set up house in Helsinki, in Wladimirinkatu, now Kalevankatu. At the same time, Sibelius renewed his close friendship with Robert Kajanus and the artist Axel Gallén (later Akseli Gallen-Kallela). Thus began the sessions of the "Symposion" (Greek: a drinking club, or a meeting for philosophical discussion). The sessions were held in the Hotel and Restaurant Kämp and could last for days on end. During them the three men and their artist friends discussed fundamental questions of art, sorely trying the patience of their spouses who were waiting at home. At first, the Symposion sessions took up only a small part of Sibelius's time. He was teaching theory and violin playing at Wegelius’s Music Institute and at Kajanus’s Orchestra School. Sometimes he had over 30 hours of teaching in a week. In addition to teaching, he put the finishing touches to seven songs to words by Runeberg, and he actually managed to get them published in Finland. However, the main work in the autumn of 1892 was the composition of En Saga. "There is passion in it, Rausch [intoxication]," he wrote to his friend Adolf Paul, mentioning also the paintings of Arnold Böcklin. The composition of En Saga was interrupted by the funeral of his grandmother Katarina Borg. The funeral marked Sibelius’s farewell to the Hämeenlinna of his childhood. After the funeral the composer’s childhood home was sold. A version of En Saga, longer and more heterogeneous than the present version, was performed for the first time on 16th February 1893. helmikuuta 1893. "If only his musical intuition were a little less capricious," complained Karl Flodin, the critic from Nya Pressen. Oskar Merikanto ventured to suggest that Sibelius could cut out certain superluous parts of the work. Sibelius did in fact do this in 1902. The worst blow came in March 1893, when Sibelius conducted Kullervo three times. The critic from Uusi Suometar found the work incomprehensible and the performance lacking in vitality. According to Aftonbladet, the work was long, monotonous and tiresome. In his old age Sibelius recollected that even friends suggested he should give up and become "an organist in Porvoo". March 1893 saw the birth of Aino and Janne’s first-born child, Eva. And for a change, Sibelius had success as a composer, when his choral piece, Väinämöinen's Boat-ride, was performed in April. Even the critics considered this work to be good and accessible. According to Sibelius, the Boat-ride exploded like "a bomb". It was now that Sibelius’s brief Wagnerian period began. In the summer of 1893 he was planning an opera based on the 6th and 16th runes of Kalevala. He intended to write The Building of the Boat according to the model laid out by Wagner in his essay Oper und Drama. "Sävelet pääsevät oikeaan voimaansa vasta silloin kun niitä ohjaa runollinen tarkoitus. Toisin sanoen kun sana ja sävel yhdistyy", Sibelius päätteli. As an overture for the opera Sibelius composed The Swan of Tuonela. He went to the Wagner Festival in Bayreuth in the summer of 1894 to further immerse himself in the Wagnerian style, but eventually the Wagner worship led to a reaction. The trigger for this was his study of Liszt’s Faust symphony. "I think that I am really a musical painter and poet. I mean that Liszt’s musical standpoint is the one that comes closest to me. That [concept of a] symphonic poem," Sibelius concluded. The opera came to nothing, but from the drafts he began to prepare his Lemminkäinen Suite. During the years when he was planning an opera, other works were completed: the Viipuri Students’ Association commissioned music for scenes from the history of Karelia. This gave rise to the Karelia stage music from which Sibelius later prepared the Karelia Suite. The stage music and especially the suite, which was prepared in a hurry and was longer than the present version, was well received in critical circles. However, in a competition organised by the Helsinki Student Singers, Sibelius only came second with his choral work, The Lover. His teacher Emil Genetz won the competition with his patriotic song Hakkapeliitat. After the journey to Bayreuth in the summer, Sibelius gained dubious publicity when a painting by Axel Gallén portraying the Symposion group was included in the autumn exhibition. 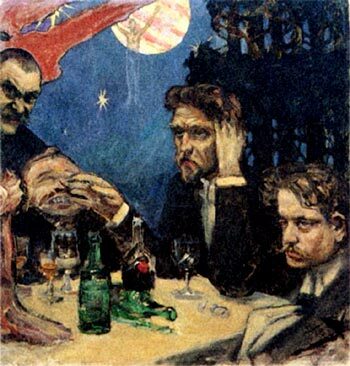 In the painting, Sibelius, Kajanus, Gallén and a drowsy "citizen" are sitting in a restaurant, drinking Benedictine liqueur and contemplating the wings of Osiris, lit by the glow of a deeply symbolic background. "Kajustaflan": The first version of a painting of the Symposion group by Axel Gallén (later Akseli Gallen-Kallela). From the left, Axel Gallén, the composer and critic Oskar Merikanto, the conductor Robert Kajanus and Jean Sibelius. The painting led to Sibelius becoming labelled as a hard-drinking artist, and even made it more difficult for him to obtain loans. Nevertheless, the composer later recollected the Symposion nights with pleasure. "The Symposion evenings meant a great deal to me at a time when I would otherwise have been more or less alone." Towards the end of 1894, Sibelius’s second daughter Ruth was born. In March 1895 "the first sketch" of The Wood Nymph (a melodrama for narrator, strings, two French horns and piano) was performed for the first time. The orchestral version of The Wood Nymph was performed on 17th April 1895. The Wagnerian features of this erotically charged work were more obvious than before. The Wood Nymph was forgotten for decades until a recording by the Lahti Symphony Orchestra under Osmo Vänskä became a minor media event in the 1990s. However, Sibelius was intent on composing the Lemminkäinen Suite, and despite his debts, he applied for leave from the Music Institute in the autumn of 1895 to complete the work. The work was ready for rehearsal in early April 1896, but the orchestra of Kajanus still had doubts about it. In the end, the performance turned out to be a box-office success, but opinions varied. Oskar Merikanto praised the work, but Karl Flodin had reservations: for example, he thought that the cor anglais solo in The Swan of Tuonela was "stupendously long and boring". The Järnefelt family. Alexander Järnefelt died the day after the first public performance of Lemminkäinen. In this group portrait we see (standing) the author Arvid, the composer-conductor Armas, the painter Eero, and his wife Saimi Järnefelt. 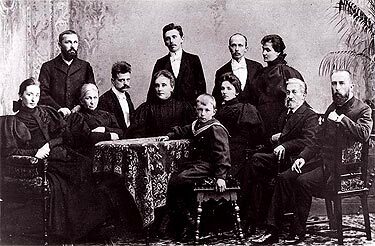 Sitting are Aino Sibelius, Elisabeth Järnefelt, Jean Sibelius, Emmy (Arvid’s wife) and Eero (Arvid’s son), Elli Järnefelt (Aino’s sister), Mikael Clodt (Elisabeth’s brother), and Kasper Järnefelt. Between composing major works Sibelius wrote a Coronation Cantata for the university, but its first public performance on 2nd November 1896 was ruined because one of the musicians was drunk. Sibelius went on to write a one-act opera, The Maiden in the Tower. Audiences had now come to accept Sibelius, but once again the critics had reservations. Sibelius forbade the performance of the opera soon after its first public performance. Nevertheless, he conducted the overture several years later. On 25th November 1896, Sibelius applied for the post as music teacher and successor to Richard Faltin at the University of Helsinki. The subject of the trial lecture was folk music and its impact on the art of music. Sibelius gave his view as follows: "There is a curious parallel between our time and the century preceding Bach. At that time, the modes used in church music were in a state of dissolution. They could not be kept up, as they were too analytically-based, lacking a solid foundation. They had to make way for tonality, which was based on ancient folk song. Now it is becoming very clear that our modern tonality is faltering. "However, there is no point in tearing down the old if there is nothing new to put in its place. This cannot be done by artificially creating a tonal system - it has to be discovered as something that is alive in folk music. "Indeed, I would venture to claim that all the things that we might call interesting turns of phrase, modulations, and so on, will have only transient value if they do not have their seed in folk music." The trial lecture was somewhat fragmentary. Sibelius was in fact recommended for the post - but Robert Kajanus made a complaint and finally won the struggle. This cooled the relationship of the friends considerably. Although they continued to cooperate, Sibelius was suspicious of Kajanus and often gave vent to his contradictory feelings in his diary. Thus the inner trio of the Symposion circle was dissolved: Gallen-Kallela was often abroad or travelling in the desert. Kajanus and Sibelius were now seen as competitors, even though they continued their cooperation. The most intensive stage of the Symposion years was already over by the end of 1894, and now the communal spirit of the Symposion disappeared for good. "I was ready to go my own way," Sibelius later recollected. "The atmosphere of the 1890s never returned."